Together with Paris, Rome, Tokyo, Hong Kong and other 5 cities, Beijing was chosen to be one of the top ten popular food cities over the world by the famous magazine Forbes. The history of Beijing’s cuisine is as long as the history of Beijing itself. As Beijing is the capital city for Liao, Jin, Yuan, Ming and Qing Dynasties, Beijing food is based on northern cuisine and has absorbed the essence the all parts of China. You can find almost all the typical food of China in Beijing, even foreign food. Imperial Court Cuisine is a unique feature of Beijing Cuisine. The best chef from all parts of China went to the imperial court to make dishes for the emperors and other members of royal family. Peking Roast Duck is a famous duck dish from Beijing that has been prepared since the Yuan Dynasty, The dish is prized for the thin, crispy skin, with authentic versions of the dish serving mostly the skin and little meat, sliced in front of the diners by the cook. Ducks are bred specially for the dish, which after 65 days are slaughtered and seasoned before being roasted in a closed oven or a hung oven. 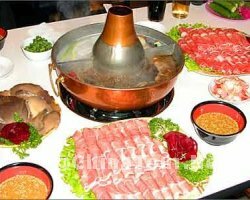 The meat is often eaten with pancakes, spring onions, and hoisin sauce or sweet noodle sauce. 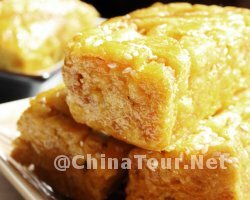 Tanghulu, also called bingtanghulu, is a traditional beijing snack, also can be seen in other cities in China. 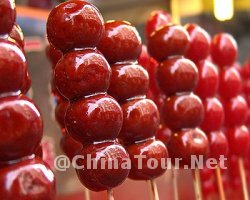 It consists of candied fruits on bamboo skewers that are approximately 20cm long. This snack can be found widely along the Beijing snack street Wangfujing and also there are street vendors who travel from place to place selling it. Anyone who has been to Beijing cannot claim to have missed seeing the colorful skewers threaded with sugar glazed berries called tanghulu. For people who come to Beijing, they will eat Peking Duck. For people who want to eat Peking Duck, most of them go to Quanjude Reataurant. 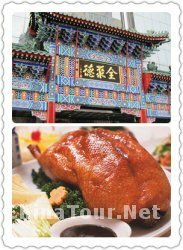 Its roast duck is very famous with over one hundred years’ history. 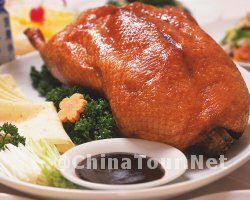 Among them Quanjude roast duck is well known among both domestic and overseas customers. The duck is hung in the oven and roasted by flame burning from fruit-wood. It takes about 45 minutes for the duck to be done. The finished duck is characteristic with crispy skin, tender meat and the fragrance from the fruit-wood. It looks wonderful and appealing with a full figure, even claret color and the brightness and shine on the duck skin. 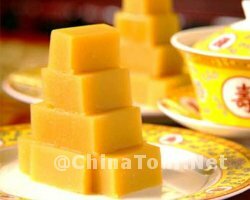 It tastes pure and mellow with lotus leaf-shaped cake, scallion slices and sweet sauce jam, leaving a lasting and pleasant aftertaste. The original Donglaishun opened in Beijing more than 100 years ago. 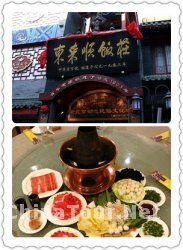 The restaurant is famous for its authentic “Shuan Yang Rou” – paper-thin slices of Inner Mongolian black-headed mutton. 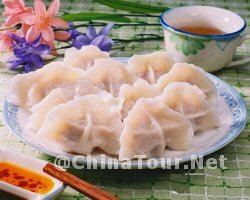 These stay tender even when boiled for long time and are accompanied by sauces made from ancient secret recipes.Huaiyang cuisine is also offered. It uses traditional copper devices that heat the cooking water with coals. Their lamb is consistently fresh and of a high-quality, while their shaobing will impress the most finicky of gourmands. Huguosi Snack is one of the representives of Beijing snack. There are various snacks of different flavour, including Aiwowo, Pea-Flour Cake and many other snacks. By following the wafting aroma of cooking, tourists can find the most natural and simple flavors of Old Beijing in the street. 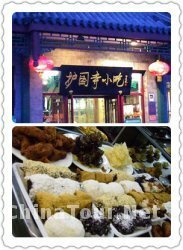 Located at the northern entrance of Wangfujing Street, Donghuamen Night Market is the most famous snack street in Beijing, popular with both locals and tourists as well. A dazzling array of snacks from all corners of China can be found here. The majority of diners here are foreign, and the cost is not low. However, for a comfortable and relaxing meal, Xin Dong An Restaurant comes highly recommended.